You are currently browsing the tag archive for the ‘child bearing’ tag. Ladies, have you had your vitamins today? 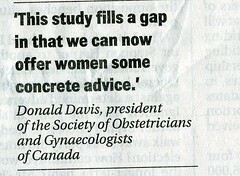 I read the an article in the Globe & Mail this morning (click here for link to the article) , it was on the front page. What I found interesting was that they recommend that ALL women of child bearing age taking vitamins as most pregnancies are unplanned, and the birth defects occur in the first trimester. I do not want to get pregnant now, but eventually (not for another couple years) I do and this would be a good per-cautionary measure. I find it shocking the rate it decreases birth defects by. I do however think this study pertains more to other parts of the world, but if it helps everyone why not, Canada still has 45.5 birth defects in 1000 births. Being a women who is already concerned about her fertility and birth defects (perhaps all women are), why not help out the odds?